To meet the diverse requirements of our esteemed clients we are manufacturing, trading, wholesalling, distributing & exporting a beautiful collection of antique mala sets. manufactured using premium quality uncut diamonds, kundan, meena, colored beads & precious & semi-precious stones, these jewellery sets are available with us in various intricate designs alluring patterns sizes & finishes. 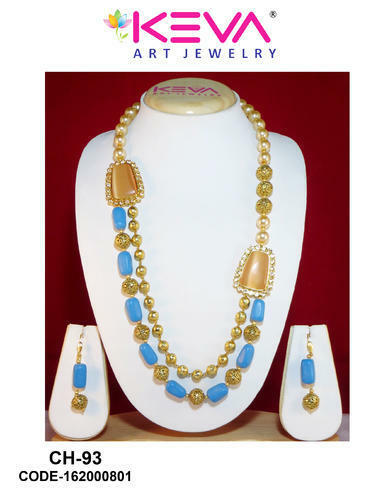 offered array of exquisite jewelery sets in very elegant & stylish. Integrated in the year, 2011, we have carved a niche for ourselves in the domain of manufacturing and supplying a beautiful collection of Artificial Pendants, Earring & Jewellery Sets. This tremendous assemblage offered by us comprises Polki Earrings, Antique Earrings, Silver Antique Earrings, Beaded Kundan Jewellery, Designer Kundan Jewellery, Kundan Pendant, Temple Pendant Jewellery, Antique Thewa Jewellery to name a few. Designed by our creative artisans, these jewellery are widely acclaimed in the market for their, enticing designs, mesmerizing sheen and fascinating patterns. Conforming to the latest fashion and market trends, these jewellery are available in variety of sizes, shapes and color-combinations. Widely demanded by the women of all ages, these jewellery are offered at market leading prices. Our ultra-modern infrastructure along with the team of skilled professional has enabled us to design and develop these jewellery as per clients' specific demands. Further, we competently meet the urgent and bulk requirements of our clients within the promise time frame. Catering to the variegated needs of our innumerable clients enable us to acquire maximum client satisfaction. Moreover, owing to the quality oriented approach and transparent dealings of our enterprise, we have been able to acquire goodwill and credibility in the market.